One of the best opportunity’s to promote your skills in the AAU circuit, to high school and/or college coaches is to attend as many basketball showcases, tournaments and events (early on). These days (especially if you are not being highly recruited) the basketball showcases could be a very good opportunity to get the much needed exposure that you need to get noticed by colleges. Lewis Sports Academy (LSA) will continue to promote and uplift young athlete's, present showcases, skill development clinics, elite training and participate in the most competitive basketball tournaments in the state of GA and across the nation. Youth basketball has become flawed, because some coaches and parents judge whether they've had a successful season based on wins and losses rather than if the players have improved and actually enjoy the game. Without skill development and enjoyment of playing the game, players will never succeed at the higher levels of basketball because they won't be good enough and/or they won't want to practice. Does your basketball player desire to play middle school, high school or even college basketball? Playing recreational basketball or making your middle and high school team does not mean you will perform at your best and get valuable playing time. Are you interested in Elite 101 Basketball Training? Get involved in an affordable weekly or monthly group program that will enable you as a basketball player to take your basketball game to the next competitive level. 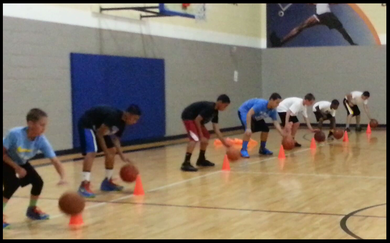 The normal (1 1/2 - 2 hour) session include group fundamental skills as well as competitive sessions. Westlake HS Assistant Varsity Coach, Youth Elite Trainer, Game Elite AAU Coach, LSA Director, LSA Coach and LSA Elite Youth Basketball Lead Trainer. Coach Lewis has (3) GA High School Championship Rings, (1) AAU 7th Grade National Championship and over 20 years of Coaching experience. If you want proven results, review weekly schedule (show up) and pay $35 per session or select one of (Elite 101 Group Training Programs) - Hit drop-down button below.